The velociraptor blinks a few times and begins to shout in English, moving its claws around in a terrifying welcome. Yikes! You have to remind yourself that this is normal at Henn na Hotel (“henn” meaning “weird”). 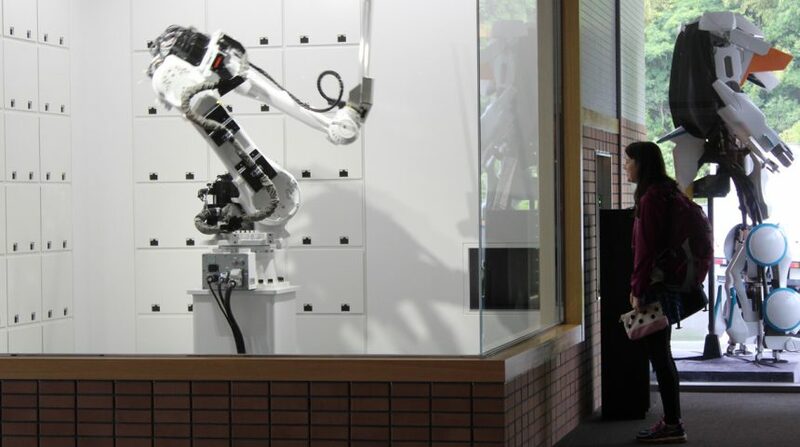 The aptly named establishment is Japan’s first robot-staffed hotel. The hotel opened in July 2015 among much fanfare, and is hailed as a technological advancement rather than a gimmick. 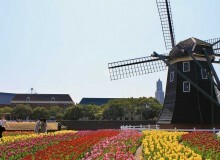 It’s located in a rather bizarre part of the Sasebo area, within the premises of Huis Ten Bosch, a Dutch-themed amusement park. 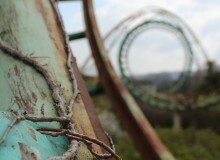 The theme park itself takes over a massive plot of land with its elaborately designed train station, restaurants and souvenir shops, and expensive outdoor attractions that include bungee jumping and zip-lining. The hotel contrasts with its box-shaped modernist exterior. The only thing that gives away its futuristic theme is the giant Gundam figure guarding the entrance. 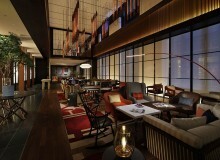 Walking into the lobby, it immediately becomes clear that Henn na is of a special breed. Chu-ri, a pink stuffed robot, greets guests as they enter, informing them to proceed to the check-in counter. This is where the fun begins: three robots—one dead-eyed woman and two Jurassic Park-esque velociraptors—eagerly await, already moving with anticipation. As you approach, they welcome you in Japanese, English, Chinese, and Korean, moving with animatronic horror. 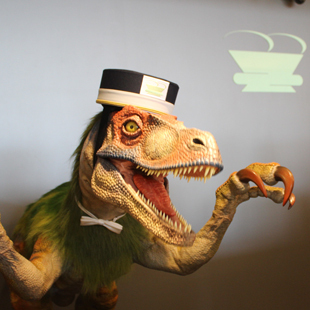 The check-in was completed when I entered my name into the corresponding computer screen, and our velociraptor Kibou, who was sporting a bellhop hat and bowtie, bowed. The fantasy was soon ruined, however, when a human staff member came out to ask for our passports. Alas, the hotel relies on human staff for security and cleaning. Also on display in the lobby are robotic porters, but only for the exclusive guests in Building A. All guests can use the robotic cloak room (¥500); we made sure to test this out, if only to see the huge arm wave in thanks. The rooms themselves are rather mediocre, but technology abounds. To gain access, the locks use facial recognition. The room temperature is adjusted via sensors that read body heat. A miniature version of Chu-ri controls the lights and answers simple questions. Though an instructional book dictates how best to communicate with her, we found her actions rather annoying. Her “What time is it?” sounded more like “OK, turning off the lights” in a sarcastic tone. The lights were turned off, and so was she. Breakfast can be included in the room charge, and entails a rather elaborate and healthy buffet in an adjacent restaurant with its own visible greenhouse. At about ¥10,000 per person, it’s hard to justify a stay unless you happen to be either visiting the amusement park or traveling between Fukuoka and Nagasaki. My advice is to simply hack the system by visiting the lobby, where the receptionists will speak to whomever approaches. Furthermore, the robotic cloak device in the lobby will take your money, whether you are a guest or not. 1-1 House Ten Bosch, Sasebo, Nagasaki. Nearest Station: Huis Ten Bosch. Tel: 0570-064-110. www.h-n-h.jp/en.